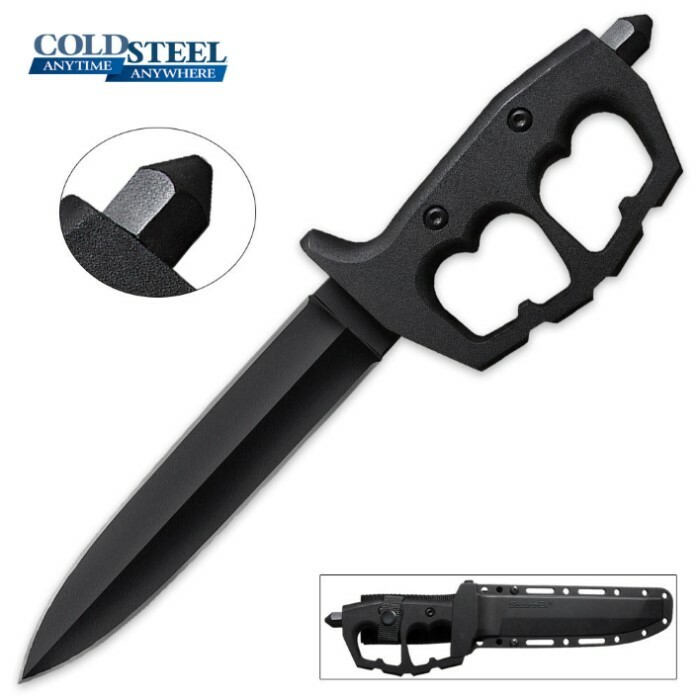 Cold Steel has taken the concept of the classic trench knives from the World Wars and reimagined them to create a contemporary tactical fixed-blade combat knife for the modern day warrior. The 7-1/2" bayonet-style blade is crafted of SK-5 high carbon steel with a non-reflective black coating and sharp edges on both sides. The Chaos also features the black Tuff-Ex treatment for supreme corrosion resistance. Rather than a traditionally designed knuckle guard handle, the Chaos has an updated D-ring guard crafted of reinforced 6061 aluminum for a powerful punch and adequate knuckle protection. It also features a powerful tapered spike on the pommel. It comes with a military-style Secure-Ex reinforced sheath with a belt loop. Measures 13-1/2" overall in length. Very nice. Great craftsmanship, feels great in the hand, and the sheath is really impressive. I recommend this highly for those who collect, or just want a non-firearm bedside self defense "security blanket". Bought one of these...love it! Solid as a rock (all metal) and fits my bear paws with room to spare. This is not a small knife. Blade came with pretty good factory edge, but of course I reworked it to my own specs. Sheath works fine, is even quite secure without using the snap loop if you want it ready to use in a hurry. One note about the sheath...if you practice drawing and re-sheathing a lot, you might find that the edges get slightly dulled after a good number of cycles in and out. Just re-sharpen afterwards. When you really need it, you're only going to draw it once, after all. So, if you want something to "slash, smash, and bash" with authority, this is the perfect item for you. If you are thinking about getting this knife, do it. You will not be disappointed. The blade isn't the sharpest out of box, but that's an easy fix and honestly it's plenty sharp. Buying this knife from BUDK also gives you a great deal, I highly recommend.